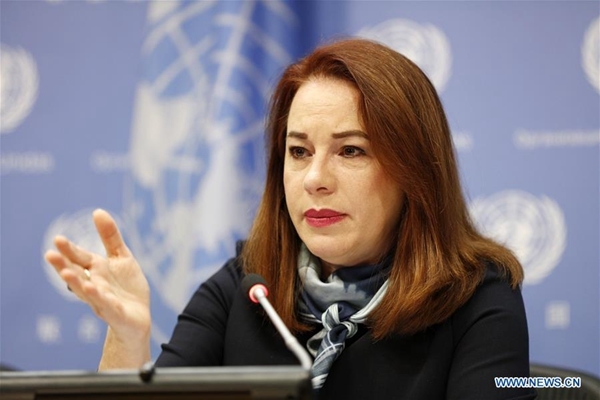 UN General Assembly President Maria Fernanda Espinosa Garces on Wednesday called for a specific outcome at next month's UN climate conference in Katowice, Poland. "What we expect in Katowice is to have a strong agreed program of work for the Paris Agreement (on climate change)," she told reporters at UN Headquarters in New York. "It requires a lot of political will, a lot of commitment, a lot of flexibility in the negotiations." Espinosa, who will be in Katowice for the opening of the climate conference, said climate action is urgent. The world needs to act as quickly as possible toward a green economy and to generate low-carbon technologies, which are good for both the environment and economic growth, she said. Espinosa also saw the need for a cultural shift in production and consumption patterns to stop temperatures from increasing 1.5 degrees Celsius above pre-industrial levels. "Climate change is a survival issue," she said.